You’d think I would know better by now. And yet, I naively continue to be amazed at how some folks willfully delude themselves and work like there’s no tomorrow to stay ignorant. This graphic is a case in point. It was posted on an atheism Internet community; in my experience, most of the people in these communities know their Bible pretty well. Then someone uploads a graphic like this…..
Now consider the evidence of hundreds of thousands of years: all the bad things me, you and the rest of humanity have done (and the good things we’ve failed to do). Could there be a clearer measure of proof that God is serious about the gift of freewill? Indeed, God could have stopped Roman authorities from putting Jesus Christ (whom serious Christians believe is His divine son) to death on trumped-up charges. But he allowed freewill to take its course. 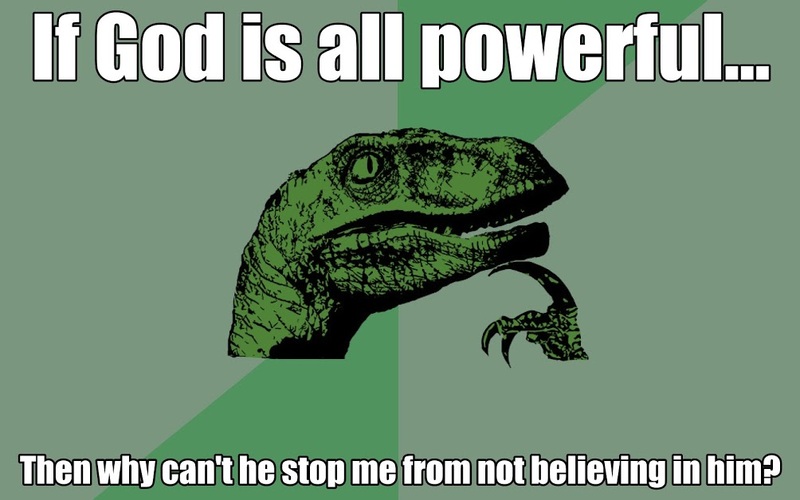 My point here is that God could easily force people to believe in Him. But what would be the point? To prove He’s powerful? Really? I don’t think the creator of time, space and the universe needs to prove a darn thing. The truth is this: “If you openly say, ‘Jesus is Lord’ and believe in your heart that God raised him from death, you will be saved.” That’s from ‘Romans’. Saved from what? From being judged on all the bad things we’ve done and the good things we’ve failed to do. When I decided to follow Jesus, His sacrificial death on a Roman cross cleaned my account with God. God no longer sees my mistakes, my pettiness, my times of thinking I can do everything without Him. He sees me as perfect – just like Jesus. Thanks for the insightful article. The question posed is misleading because, as you mentioned, God has the ability to make everyone believe, but He chooses to allow humans to make the decision as a result of free will. It would be against God’s nature to coerce an individual to believe and accept Him. You can’t make someone accept a gift. I’m with you on this, chaddamitz. Some folks (like the person who created the graphic) like to miss the point. The decision is a result of free will. It would be against God’s nature to coerce an individual to believe in and accept Him. You can’t make someone accept a gift. Oh, this makes all the sense in the world! What we do wrong or fail to do right surely grieves God’s heart, but He will never take away our free will and our freedoms to choose. He needs people to love Him and follow Him willingly. Great thoughts, Frank! Have a blessed week! But God providing proof and convincing people would not destroy their freewill. The devil. He lived with God and was around him and he left. He was given the freewill to reject and presumably we would too. Thanks for your comment, Peter. I’m not sure I understand it; are you saying God gave us freewill with the presumption we would reject Him? I think to tie the lack of evidence for any god to a penchant for free will is a poor argument. It doesn’t interfere with my free will to know that a traffic light exists. I can choose to obey the light or run it. A god is more analogous to a traffic light no one can see and no one can prove is there. Opinions vary as to whether it is red or green on any issue. Actually seeing a light doesn’t interfere with my will. It does however allow me to make an informed decision. Whether theists claim their god can or won’t reveal itself doesn’t matter. If it truly cared whether people stopped on red and proceeded on green it would. I do agree that this says nothing as to whether such a god exists. But evidence of existence would not thwart free will. As to the arguments presented as to why a god doesn’t stop bad things… Free will is also a bad defense. The author used 9-11. Did the hijackers free will trump all others? What about the free will of the people in the towers? Thanks for your comments, Bill. I think it’s plain that as much as any of us know about freewill, it’s still a mystery in many ways. And who is to say that freewill never hurts others? This essay certainly makes no such suggestion. Also, I’m curious as to where I tie any evidence for or against God to freewill. This essay (and the atheist graphic that inspired it) makes the assumption that God exists, so I’m not sure what you’re getting at. Well I respectfully disagree with your assessment of the graphic. The author clearly indicates he does not believe such a god exists. The meme which is crude is a response to the theist claim. 2. That God is all powerful. 3. That God care whether people know it exists. If both 1 and 2 are true such a god would have the ability to convince everyone that it exists. If 3 is also true it would want to convince everyone it exists. And doing so in no way interferes with free will. In fact the best exercise of free will would be a fully informed decision. Your response is more to a problem of evil which might ask if an omni benevolent god exists why does it not intervene. Also a pertinent objection not the one the graphic raises. Well, I can’t say I’m worried about what some people think the graphic is about. I wrote my essay about what the graphic says to me. Nothing more or less.